The World Health Organization’s (WHO) International Agency for Research on Cancer’s re-categorization of glyphosate as “probably carcinogenic” prompted a year-long analysis of the County of Marin’s use of toxins to control weeds and manage invasive plant species, such as broom, on County-owned property. Marin County Parks, already acknowledged as a leader in Integrated Pest Management (IPM) practices, ceased using glyphosate in 2015 on all County-maintained parks, landscaping, adjacent buildings, playgrounds, walkways, parking areas, and medians in unincorporated areas of Marin County. Commercial, agricultural, and government use of toxins requires specialized training in safe application methods, and is carefully regulated and tracked. Conversely, private residential use of many of these same products, purchased at retail outlets, is unregulated. There is no data available to track sales of these products, application methods, or the frequency of application by private and non-commercial users. However, there is significant anecdotal evidence of widespread use of these products that far surpasses use by licensed commercial, agricultural and public-sector (government) agencies. The Marin County Board of Supervisors, recognizing the environmental and public health benefits and the community’s expressed interest in dramatically reducing the use of toxins in the landscaped environment, has funded a two-year, multi-pronged education and outreach campaign to communicate to the general public about the use and misuse of toxins on private property and ornamental landscapes. On June 22, 2016, the Board of Supervisors approved a $100,000 budget for the two year outreach effort. The San Francisco Estuary Partnership, as part of the EPA-funded SF Bay Water Quality Improvement Fund grant program, provided an additional $90,040 contract for campaign development support. This public-private outreach and education campaign effectively utilizes existing County and community-based networks and expertise. 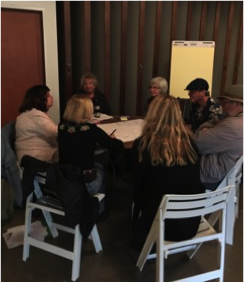 A coalition was formed that includes members of the public who represent specific sectors and perspectives: retailers, landscape managers, environmental experts, Integrated Pest Management experts, property owners, pest control operators, public health and animal health experts, master gardeners, youth, bee experts and other community and sector representatives from around Marin. They are supported by staff from several departments from the County of Marin and the advertising and campaign development expertise of Bay Area advertising consultant Gigantic Idea Studio. County staff, representing the offices of Marin County Supervisors Kate Sears and Katie Rice, Marin County Parks, Marin County Stormwater and Pollution Prevention Program (MCSTOPPP), and Health and Human Services, and the Chair of the Integrated Pest Management Commission, have worked collaboratively with this broad group of community members since the fall of 2016. Using an online survey, the work began with a baseline assessment of current public awareness and use patterns, and then set specific and measurable outreach goals for the campaign. Phase One is focused on controlling weeds. This phase of the two year outreach plan will run from April – June of 2017, with a grassroots effort by the coalition, supported by a media campaign that includes bus shelter ads, newspaper ads, social media, and public service announcements at selected movie theaters in Marin. The effectiveness of the campaign will be measured at the conclusion of Phase One, and will assess changes in knowledge, awareness, and/or behavior in target audiences, as well as the level of impact that different approaches have. The grassroots outreach campaign will continue into the fall of 2017, after the advertising campaign is complete. After assessing the effectiveness of Phase One, the coalition will begin work on Phase Two, broadening the campaign to possibly include rodenticides, insecticides, or other toxic chemicals, with a launch planned for Spring 2018. We welcome your comments and suggestions. Please email us at info@yardsmartmarin.org.